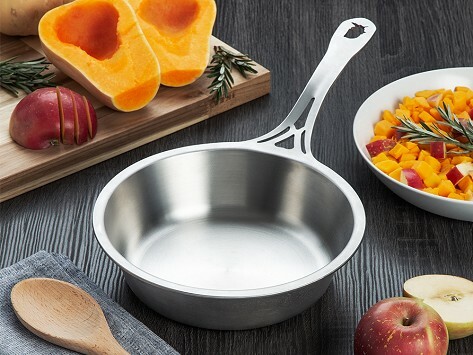 The ferritic stainless steel pans from SOLIDTEKNICS are built to last a lifetime. Made in the USA from U.S.-sourced steel, the sauteuse pan heats up evenly and faster than an aluminum pan. It has a seamless one piece construction that boosts durability—no screws, rivets, or gaps for build-up to collect. The pan works with a variety of heat sources and can go into the oven, onto an open flame, and cleans up in the dishwasher. Dimensions: 8" Pan: 17.4" x 6.13" x 2.3"; 11" Pan: 21.5" x 8" x 2.63"
Weight: 8" Pan: 2 lbs. ; 11" Pan: 4 lbs. This pan is well made, cooks & cleans up great. It’s not so much a frying pan persay as it’s deeper than a typical fry pan. I haven’ten’t cooked eggs in it for this reason. I have prepped American chop suey & other winter robust meals in it & it has worked great from start to cleanup. It’s heavy but not ridiculously weighty; works great on my induction cooktop. I will have to clean w/ soft scrub or Barkeeper soap but that’s expected for quality stainless steal. The sauteuse and flat skillet pans feel solid and have an ergonomic handle designed to offset that heft. Both work with most heat sources—including induction, gas, and electric—and can go into the oven or onto an open flame. Toss them in the dishwasher when cooking duty is over for a fast clean up.